Adapted from Commander in Cheat: How Golf Explains Trump by Rick Reilly. Copyright © 2019. Available from Hachette Books, an imprint of Hachette Book Group, Inc.
I’ve found that to be true with golf. The guy who plays slowly on the course is going to be molasses in meetings. The guy who’s generous with compliments on the course is going to do the same at dinner. And the guy who cheats on the course is going to cheat in business, or on his taxes or, say, in politics. Jack O’Donnell worked with Donald Trump for four years as vice president of Trump Plaza Casino in Atlantic City. O’Donnell’s dad was one of the founders of Sawgrass, the iconic Pete Dye golf course near Jacksonville, Fla. “My dad always told us to respect the game,” O’Donnell says. “That’s the one part of the game that tells me what kind of person you are. You play the ball where it lies.” So when O’Donnell’s office colleague, the late Mark Eddis, came back after his first round with Trump, O’Donnell couldn’t resist asking. Commander in Cheat will be available on April 2.
a) Everybody isn’t. Except for an occasional mulligan on the first tee and accepting a gimme (a short conceded putt) from an opponent, 85 percent of casual golfers play by the rules, according to the National Golf Foundation. b) To say “Donald Trump cheats” is like saying “Michael Phelps swims.” He cheats at the highest level. He cheats when people are watching, and he cheats when they aren’t. He cheats whether you like it or not. He cheats because that’s how he plays golf, that’s how he learned it, that’s how he needs it, and whether you’re his pharmacist or Tiger Woods, if you’re playing golf with him, he’s going to cheat. In fact, he did cheat with Tiger Woods. Not long after becoming president, Trump invited Woods, Dustin Johnson (the No. 1 player in the world at the time), and longtime Tour pro and Fox golf analyst Brad Faxon to play. They set up a bet: Faxon and Trump against Woods and Johnson. But because Woods and Johnson are so preposterously long off the tee, they decided Faxon and Trump could tee off the middle tees. Trump would get a stroke subtracted on the eight hardest holes; everybody else would play scratch. Off they went. Whether you’re his pharmacist or Tiger Woods, if you’re playing golf with him, he’s going to cheat. Faxon had to laugh because Trump was actually putting for a seven, but he was claiming it was for a four, which would’ve worked out to a three with his free stroke on the hole. 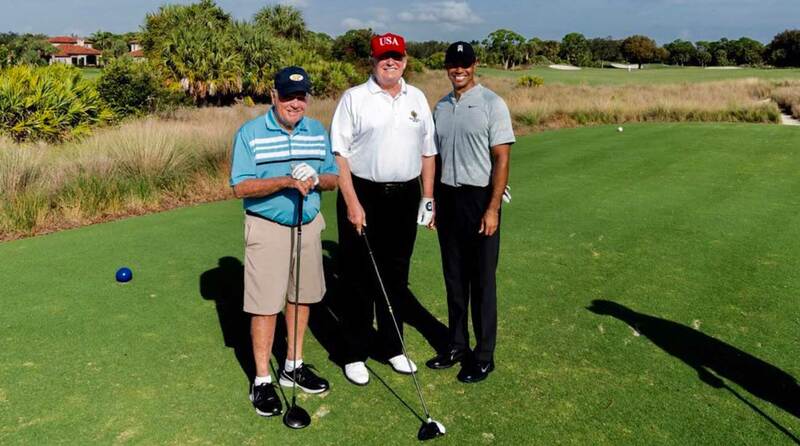 President Trump played with Jack Nicklaus and Tiger Woods earlier this year. Off they went. At one point, they were playing a blind par 5, and Tirico, who’s a 12.3 handicap, had 230 yards into the green. He hit the 3-wood of his life. “Oh my god!” his caddy said, open- mouthed. The thing had the flag covered from the start. It crested the hill perfectly and was going to be tight to the pin. Shocked at his sudden skill, Tirico high-fived his caddie and strode toward the green, his shoes barely touching the grass. But, somehow, when they got there, the ball wasn’t near the pin. It wasn’t even on the green. It was 50 feet left of the pin, in the bunker. Unless it hit a drone and ricocheted sideways, there was no physical way it could’ve ended up there. “Lousy break,” Trump said to Tirico, who checked the marking on the ball to be sure it was his. It was. Befuddled, it took Tirico two swipes to escape the bunker on the way to a 7. What did Tirico do? He laughed, shook his head, went inside, and paid Trump his money. When it comes to golf, Trump is the tornado and you are the trailer. But why? Why does Trump cheat so much when he’s already a decent player? And how can he be so shameless as to cheat right in front of people? They call him on it, but he just shrugs and cheats some more. It’s ruined his reputation in the golf world. Ninety percent of the people I interviewed — on and off the record — say he openly cheats. A lot of them said they stopped playing with him because of it. So why? Why cheat? Why lie? Why exaggerate his handicap, his scores, his club championships? To be a master golf cheat, you need some clever tricks. Trump has two sleeves full. This is a sneaky little move in which you hit your approach putt and then quickly walk up and rake up what’s left of it, no matter the length, before your opponents can stop you or think to holler, “Hey, wait a minute!” Trump has mastered this move. He does it sometimes before the ball has even stopped rolling. MSNBC cameras caught him doing it once to a ball that had sped five feet past the hole and was gaining speed. By the time anybody can object, the ball is already in his pocket. “Whenever I’ve caddied in Trump’s group,” says Greg Puga, an elite Los Angeles amateur and caddy, who has Trump in his group plenty, “he always gets his own cart. He makes sure to hit first off every tee box and then jumps in the cart, so he’s halfway down the fairway before the other three are done driving. That way he can get up there quick and mess with his ball.